Since Ovid, the concept of metamorphosis has been an irresistible temptation for writers, not only as a metaphor for shifting personal identity but as a way of exploring ideas of cultural and political transition. The essays in this volume show how authors from Ovid, Chaucer, and Shakespeare to Thomas Mann, Karen Blixen, and 20th-century science fiction writers, have used this pervasive concept to raise fundamental questions about the nature and agency of radical change. Among the broad topics addressed are how shifts in scientific understanding intersect with and even effect transformations in literary expression; the differing values attached to the language of metamorphosis over time; and the connection between these values and structures of power, particularly gender relations. 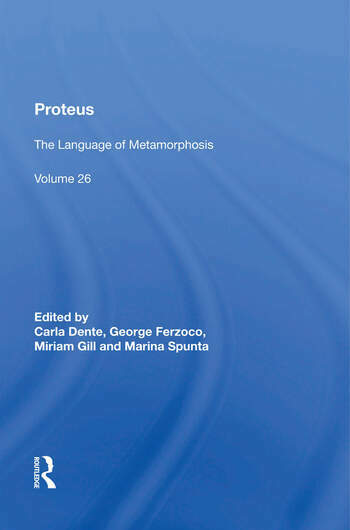 In addition to the editors, the contributors are Darko Suvin, Alessandro Perutelli, Elsa Linguanti, Douglas Burnham, Enrico Giaccherini, Lia Pacinotti, Michael St John, Rocco Coronato, Silvia Bruti, Elisabetta Cori, Judith Rorai Milanesi, Catherine Burgass, Luca Biagiotti, Stefania Magnoni, Daniel Weavis, Julian North, Ashley Chantler, Martin Halliwell, Patrick Quinn, Roberta Ferrari, Silvia Bigliazzi, and Nicoletta Caputo.